O Therion revelou alguns detalhes de seu novo álbum. 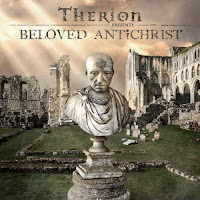 Intitulado "Beloved Antichrist", o registro será lançado no dia 2 de fevereiro via Nuclear Blast Recs. Act I: "Turn From Heaven", "Where Will You Go? ", "Through Dust", "Through Rain", "Signs Are Here", "Never Again", "Bring Her Home", "The Solid Black Beyond", "The Crowning Of Splendour", "Morning Has Broken", "Garden Of Peace", "Our Destiny", "Anthem", "The Palace Ball", "Jewels From Afar", "Hail Caesar! ", "What Is Wrong?" e "Nothing But My Name". Act II: "The Arrival Of Apollonius", "Pledging Loyalty", "Night Reborn", "Dagger Of God", "Temple Of New Jerusalem", "The Lions Roar", "Bringing The Gospel", "Laudate Dominum", "Remaining Silent", "Behold Antichrist", "Cursed By The Fallen", "Resurrection", "To Where I Weep", "Astral Sophia" e "Thy Will Be Done!". Act III: "Shoot Them Down! ", "Beneath The Starry Skies", "Forgive Me", "The Wasteland Of My Heart", "Burning The Palace", "Prelude To War", "Day Of Wrath", "Rise To War", "Time Has Come/Final Battle", "My Voyage Carries On", "Striking Darkness", "Seeds Of Time", "To Shine Forever" e "Theme Of Antichrist".